The Corsairs of Umbar have raided the Grey Havens and are making their escape. Can you prevent them from getting away with a strange and priceless artifact? 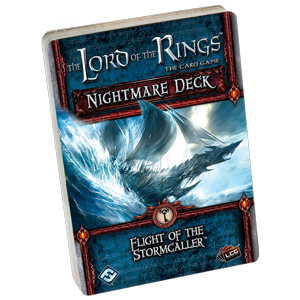 The Flight of the Stormcaller Nightmare Deck sends you sailing through stormy seas in hot pursuit of Captain Sahir and his Stormcaller. New encounter cards and rules ensure that you'll face constant pressures, even as you navigate treacherous seas and wage ship-to-ship battles. The whole time, you'll find Sahir's sailing faster than ever�threatening to make his escape for good! This is not a stand-alone product. One copy each of The Lord of the Rings: The Core Set, The Lord of the Rings: The Card Game � The Grey Havens expansion, and The Lord of the Rings: Flight of the Stormcaller are required to play.